Wouldn’t it be nice if all BOP’s were on the same page? *You must join the ExtraCare Pharmacy & Health Rewards™ program to earn Pharmacy & Health ExtraBucks Rewards™ and you must also be an ExtraCare® member. Each person must sign a HIPAA Authorization to join, even if you share an ExtraCare card. 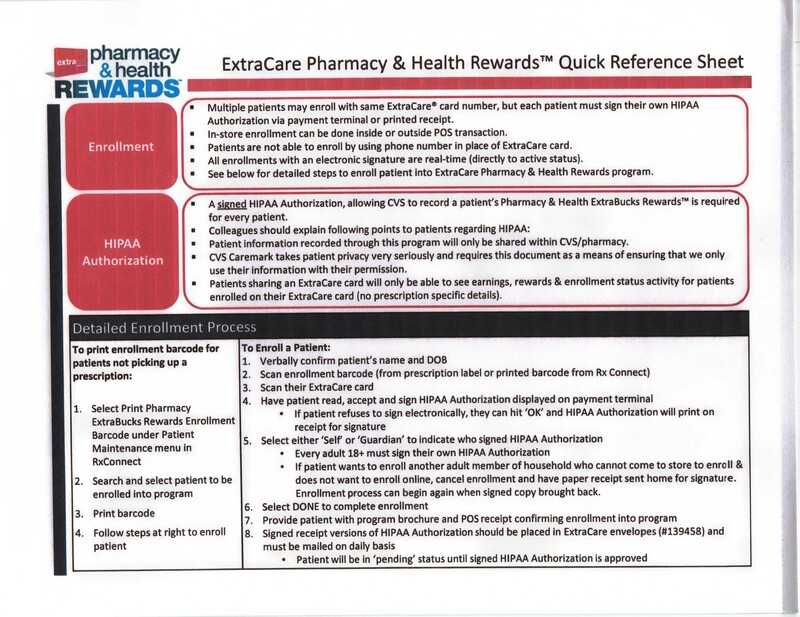 You must re-sign the HIPAA Authorization once per year to retain active enrollment in the ExtraCare Pharmacy & Health Rewards program. Adults 18 years or older must sign their HIPAA Authorization individually, but parents or guardians may sign for children under 18. Rewards earned under the ExtraCare Pharmacy & Health Rewards program are limited to $50 Pharmacy & Health ExtraBucks Rewards annually per person. Not valid on prescriptions purchased in AR, NJ or NY; on any prescriptions for controlled substances purchased in HI or LA; or on any prescriptions transferred to a CVS/pharmacy® in AL, MS or OR. Void where prohibited by law. CVS/pharmacy reserves the right to modify or terminate the ExtraCare Pharmacy & Health Rewards program at any time and for any reason. Pharmacy & Health ExtraBucks Rewards have the same restrictions for redemption as other ExtraBucks® Rewards. **Some restrictions apply. ExtraCare card must be presented to get these savings. Savings applied to total purchase with specified product. Excludes prescriptions, alcohol, gift cards, lottery, money orders, postage stamps, pre-paid cards and tobacco products. No cash back. Tax charged on pre-coupon price where required. Why does a person have to sign a HIPAA Authorization to join… is this a authorization to use the person’s PHI for marketing ? Some states prohibits these types of rebate on prescriptions… Doesn’t it also apply to Medicare/Medicaid/Tricare programs?… not listed here?? Maybe it is another one of those… we will do it until you catch us and fine us types of programs…. while admitting no wrong doing?? Here is the instructions to the staff… right mouse click and “open in new tab” to read better… notice that they are instructed to tell pt that the information will only be shared with CVS/Pharmacy.. does that include Caremark ? It is so complicated that I would have to get a lawyer to try and explain it to me.